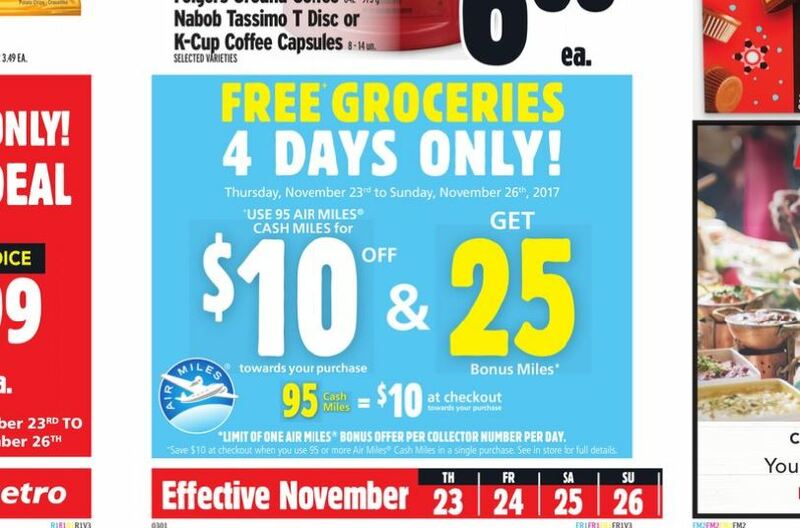 For those who are sticking to groceries rather than all the Black Friday deals, you can save a little by redeeming at Metro this weekend. Starting tomorrow, earn a 25 Air Miles bonus when you redeem 95 Air Miles for $10 at any Ontario Metro store. Even better, this counts towards one of your Shop The Block offers! That means you only need 6 more offers to earn over $200 in Air Miles. You can earn bonus Air Miles on products bought when redeeming. Nestle water is priced at $0.99 a bottle with 15 Air Miles when you buy four while Snuggle, Purex and Sunlight are $4.99 with 10 bonus Air Miles when you buy two. See the Metro Ontario flyer here. Will the 25 AM be awarded if I redeem 95 AM for purchasing the 20% discounted gift (PetSmart) cards? Any input is appreciated. Thanks for reply. Will make a call to Metro’s customer service to check this out.